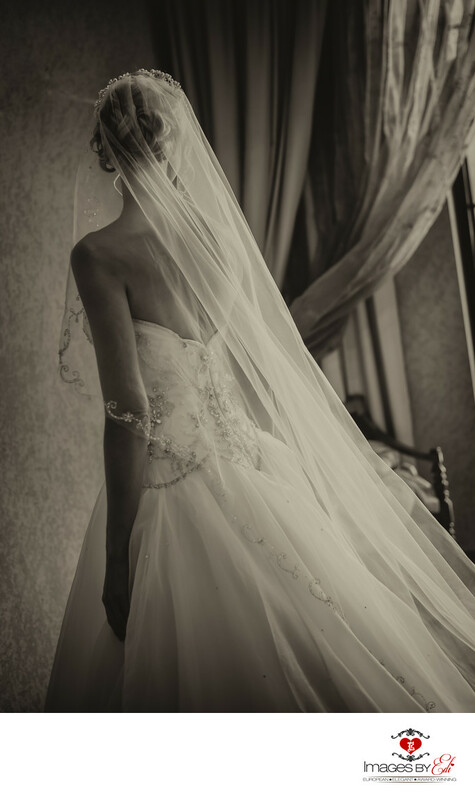 I love to photograph the bride in her room before the wedding ceremony. It's just so intimate. A totally different feeling than after the ceremony. The perfect time to capture interaction between the bride and bridesmaids and also with her family members. At this Westin Lake Las Vegas wedding, the bride was getting ready in the bridal suite overlooking to her ceremony location, the Andalusian Garden and she is just sneaking out to see if their guest arrived already. The sun from the window is shining through her beautiful long veil. I turned the image to sepia to give a dreamy look. Keywords: Bride alone (150), Westin Lake Las Vegas Wedding Photographer (153), Westin Lake Las Vegas Wedding Photography (159).